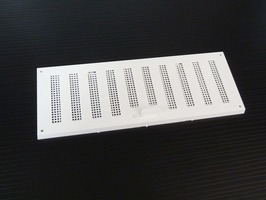 Exterior Louvre Vent White 9.5" x 3.5"
Exterior Louvre Vent White 9.5" x 6.5"
Exterior Louvre Vent and Flyscreen White 9.5" x 3.5"
Exterior Louvre Vent and Flyscreen 9.5" x 3.5" is a low profile plastic ventilator with integral flyscreen. 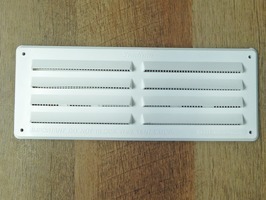 Four fixing holes one in each corner. 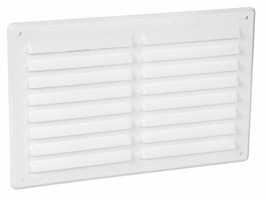 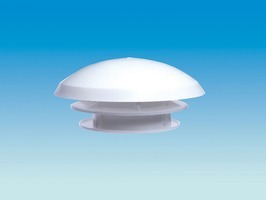 Exterior Louvre Vent with Removable Flyscreen 9.5" x 6.5"
Fixed ventilation for caravans, motorhomes and van conversions the HDK Mushroom Vent with free airflow of 28cm2 has an aperture size 110mm and suitable for roof thickness 25 - 50mm. 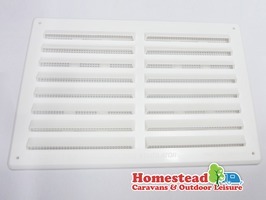 Hit & Miss Vent White 9.5" x 3.5"
Hit and Miss Vent White 9.5" x 6.5"
Interior Louvre Vent White 6.75" x 3.5"
Popular interior vent for caravans and motohomes etc. 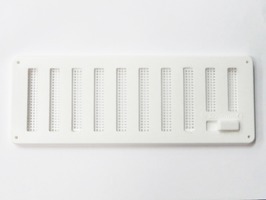 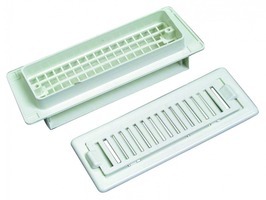 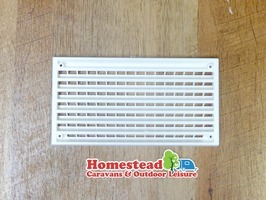 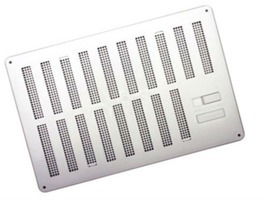 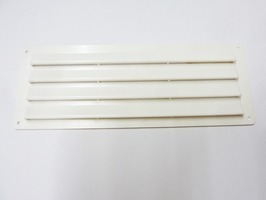 Popular Interior Louvre Vent finished in white 6.75" long and 3.5" wide suitable for for caravans and motorhomes etc.. Made from sturdy plastic with 4 fixings required to secure. 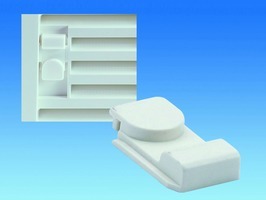 Dometic Air Vent Slider White is a replacement slider For the Dometic LS100, LS200 & LS300 fridge vents. 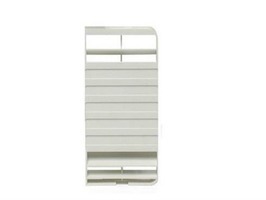 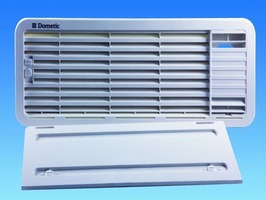 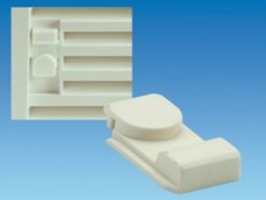 Dometic Air Vent Slider Beige is a replacement slider for the Dometic LS100, LS200 and LS300 fridge vents. 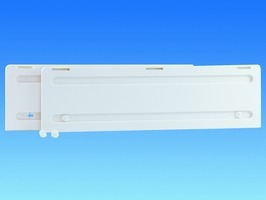 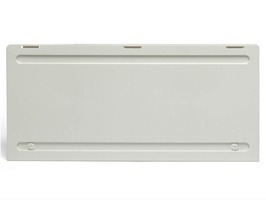 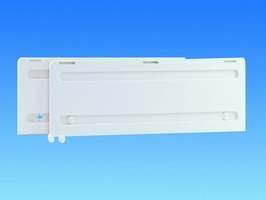 The replacement Dometic Flue Insert For the Dometic LS100 Exterior fridge vent is available in White or Beige. 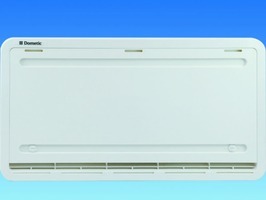 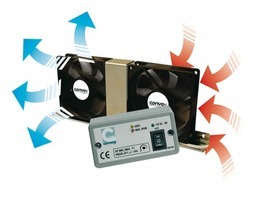 Perfect ventilation for all double-door Dometic fridges RMD8501, RMD8505, RMD8551 and RMD8555.